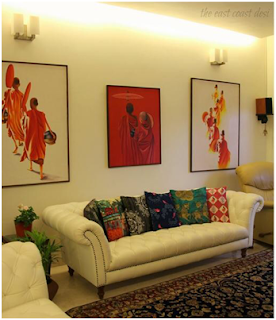 Traditional Indian interior designing gives an exotic and interesting decor to your space. Indian interior design has huge varieties because of its diverse culture, history and art. 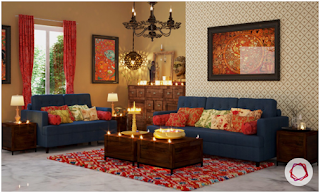 Mix and match of colors and decor elements will the home look Indian but modern. 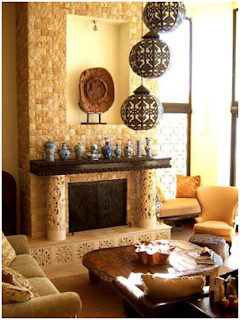 Ethnic Indian decor can be too gorgeous at times but if you are selective it can do wonders to your home. Traditional wood craft decors not only gives a traditional feeling but also gives a cultural essence. Doors and windows with wooden frames and molding will give an ethnic touch to your arena. The handcrafted wooden furniture and fittings gives a orient feeling. Sideboards, side tables, a pair of chairs or chest of drawers crafted in Rajasthani or Chettinad style gives an ornamental look and is easily available in stores. The Indian fabric is world famous but pocket friendly. The block-prints, silk, heavy embroidered, mirror-worked or hand-painted cotton fabric for drapes, furnishings and bed linen gives the plush look to your interior. Appliqué, kantha and zari work on cushions, bed covers and table runners with a light sheen in solid colors look very attractive and are best suitable for modern yet traditional home decors. India is known as land of colors. So for decorating your nest you can inspire yourself from our colorful traditional festivals like Holi. 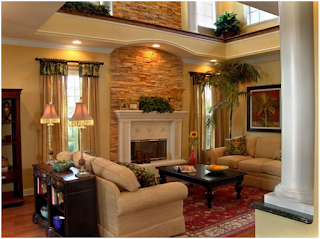 Make a color scheme that depicts warmth and comfort, some earthy tones like terracotta reds, orange and rust. You can use semiprecious jewel tones in pink, purple and dull gold. Do not clutter your home with too much of décor and furnishing or use of color. Rather go for a minimalist approach. Hang a couple of traditional brass lamps, create little vignettes on coffee tables, side-tables or side-boards. A group of Indian musician dolls, dancing dolls or even traditional tools like brass pestle and mortar, carved betel nut cracker, and miniature silver table ornaments is all you need to come out of the cliché decoration styles. Ambi or warli printings prints are a great way to give a fusion look. You can use these covering for your sofa, arm chair. Indian rugs and cushion covers are appreciated all over the world. Simple and contemporary furniture, traditional rugs and cushions with upholstery can add a stunning look to the furniture. Another wonderful way to add ethnic style is by making a collection of traditional paintings to your home. You make a statement artifact by keeping a sculpture, or a showpiece in your living room. A Raja Ravi Verma painting or an old piece from your grandparents collection will not only give a vintage touch but give a cultural enrichment to and depict your personal taste to the world. Lamps are a wonderful way to beautifully light up your area. Chandeliers, and Indian prints on lampshades are a great choice. 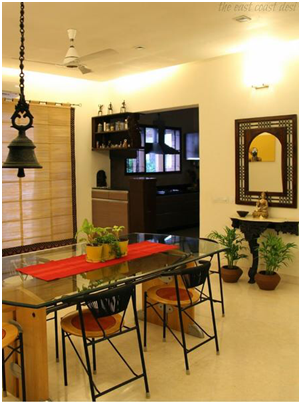 Get amazing idea to plan the lighting in your house from old house or from an old haveli. For this you will need some professional help. Give an entire modern interior set up, but go for bold ethnic wall and ceiling design. This can also be done with carvings or paintings. Ceilings are one of the important part of an interior designing. So plan your ceiling layout carefully so that it defines its aesthetics. It has a huge role in the acoustic and thermal comfort of a space. Get your inspiration from the Indian temples or from just an ordinary sari, you will see the authentic Indian patterns, culture and art. Patterns are the second most characteristic element of Indian interior design. Paisley is a well known pattern and Indian silk and cotton are the mostly used textiles in Indian home décor. India is known for its vast wealth and royalty and its rich heritage and history. Fatehpur Sikri and Taj Mahal are an example architecture marvels. Since India absorbs and accepts various international culture and so interior designing style has also changed with time. Styles like Contemporary and Zen are grabbing the young India but the traditional Indian interior design style remains always tops the chart. There are a few principals if followed then traditional Indian home décor becomes not only easy but exquisite too. Do not worry if you are not living in a plush apartment or have a magnificent house. Décor your small flat in the Indian way and notice the difference. Go for smart storage solutions and include visual elements that will make your space look larger. It will not only give the house a distinct look but will make your home look spacious and chic. The only thing you need to have is sense of space and style. The design can be from black and white to colorful rooms. 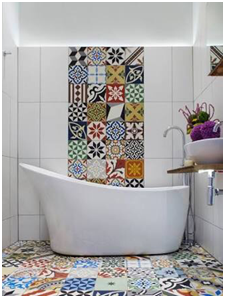 But then think out of the box chic, traditional and contemporary elements to design your place. To stand out always expensive items are not required go for low cost but splendid decoration that is unusual but original. Use ingenious home products in intelligent ways. Free Mixing: It is not essential that all stuff in a room has to match in color with each other or with the wall and ceiling color. Similarly paintings and art crafts just from a single collection may not add that beauty to your house which hand painted home décor and paintings from different artists and artisans can do. Utilize the old furniture: Antic pieces of furniture are perfect to add a traditional edge to your home. Just polish your handcrafted wooden furniture and these are ready to offer a soothing and warm glow to your residence. Paint your home with specific colors: India is a country of colors but there are few colors which specifically enhance the traditional look of the house. Red, maroon, rust with a dash of yellow or earthy tones are a must use to add a traditional Indian texture to your house. Cushions and pillows should be covered with mirror works, appliqués and embroidery to make the traditional look complete; this kind of covers also adds glitter to the drawing and bedrooms. Curtains should not be left out of the list when trying to give a traditional look to your home. Long ground touching curtains are preferred over the shorter ones for traditional Indian look. Bright colored curtains with tie backs and pull backs give an ancient look to your house. Speaking about dining rooms, adding bright colored fabrics for back rests, warm and bright colored mats and table runners fulfill your desire of giving a traditional look to the dining hall. Add a mystic texture to the bedroom by using curtains with zari border, Venetian blinds against a Peale background. Low on budget? 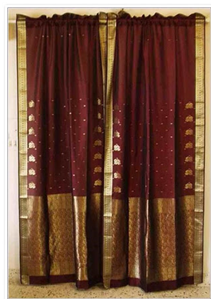 Use old silk saris to work as curtains. Illuminate your room with candles and diyas instead of electrical lamps to spread the traditional aura. Last but not the least; use traditional bells, statues and blinds made from natural fabrics and raw materials to complete this Indian traditional look. As the bells tinkle with the pleasant breeze, it creates a charming ambience. 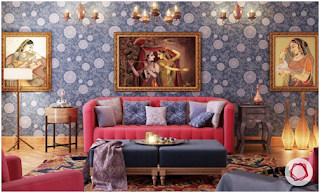 Hope this article will help you in decorating your home in the traditional Indian style. Just do it in your style and watch the magic it creates and the appreciation you get from family and friends. Besides it will create a very soothing environment in the home where you will get a relaxing atmosphere after the days hard work. After all said and done; home is where the heart is.